This bat looks like its wings are flapping. 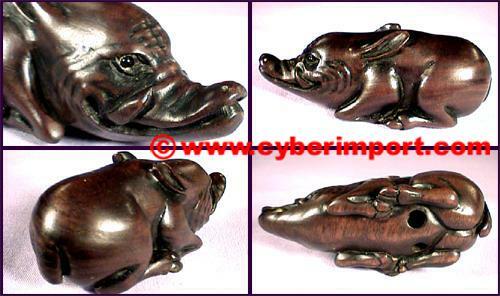 We no longer make any ironwood netsuke, but we can offer same design boxwood netsuke. nsbw092-C $8.39 15 10 2"
nsbw175 $8.39 15 10 2"
nsbw187 $8.39 15 12 2"
nsbw195-C $8.39 15 18 2"
nsbw196-C $8.39 20 17 2"
nsbw516 $8.39 15 14 2"
This well carved netsuke features a rooster. Eyes of glass inlay. Cord holes. Artist signed. 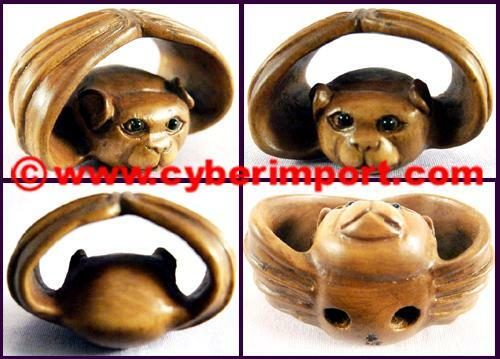 Carved from boxwood, historically one of the most popular choices for wood netsuke. nsbw228-C $8.39 15 18 2"
nsbw236-C $8.39 15 16 2"
nsbw242-C $8.39 15 10 2"
nsbw243-C $8.39 15 16 2"
nsbw256-C $9.03 15 54 1 3/4"
nsbw271-C $8.39 15 22 2"
nsbw276 $8.39 15 16 2"
nsbw277-C $8.39 20 20 2"
nsbw278-C $8.39 15 18 2"
nsbw289-C $8.39 15 18 2"
nsbw295-C $8.39 15 14 2"
nsbw320-H $8.39 15 18 2"
nsbw322-H $8.39 15 24 2"
Hand-carved, boxwood netsuke from China. Glass inlay eyes. Artist's signature on all. nsbw370 $8.39 15 15 1 1/2"x1 1/2"x5/8"
nsbw373 $8.39 15 15 1 1/2"x1 1/2"x5/8"
nsbw374 $5.42 15 20 1 1/2"x1 1/2"x5/8"
nsbw377 $8.39 15 15 1 1/2"x1 1/2"x5/8"
nsbw378 $8.39 15 15 1 1/2"x1 1/2"x5/8"
nsbw381-C $9.03 35 58 2"
nsbw436-C $8.39 15 58 2"
nsbw473-C $8.39 25 20 2"
nsbw476-C $8.39 25 12 2"
Rooster getting intimate with a hen. High detail in feathers. 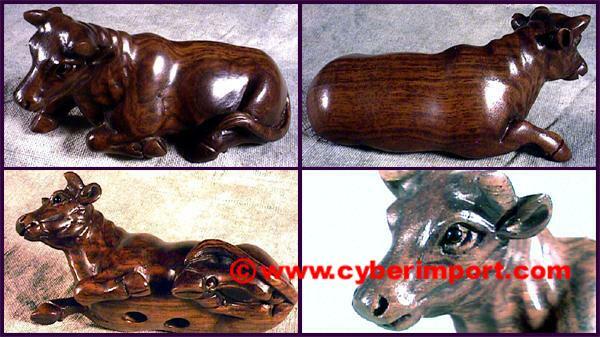 We no longer make any ironwood netsuke, but we can offer same design boxwood netsuke. 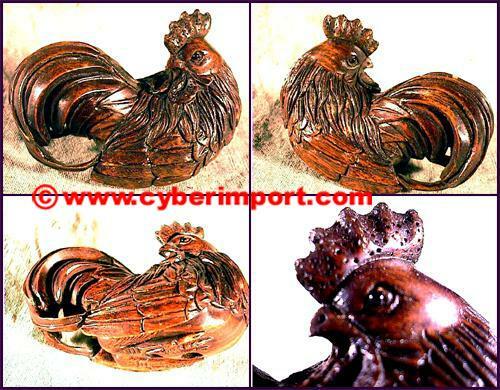 This well carved netsuke features a rooster. Appears quite proud, and looking to its left. Maybe tracking a hen. High detail in feathers. 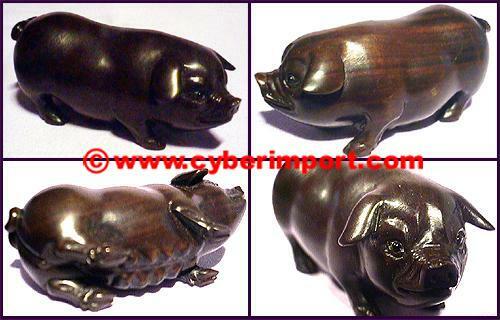 We no longer make any ironwood netsuke, but we can offer same design boxwood netsuke. Two chicks and an egg. One chick still in the egg. 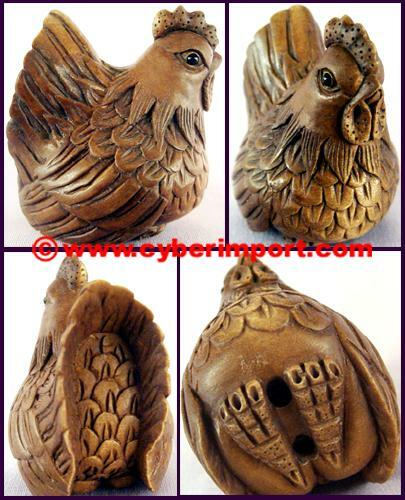 This chick has been "free-carved" and is movable, but won't fall out of the egg! 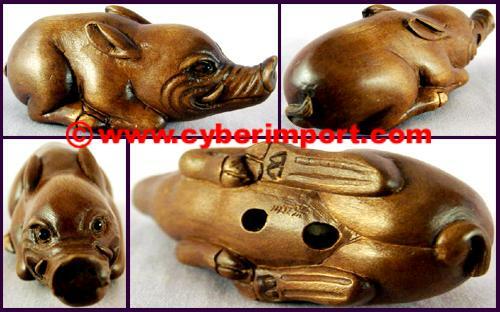 We no longer make any ironwood netsuke, but we can offer same design boxwood netsuke. 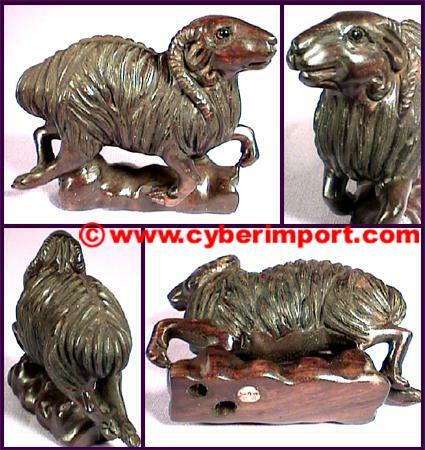 This well carved netsuke features a majestic ram. 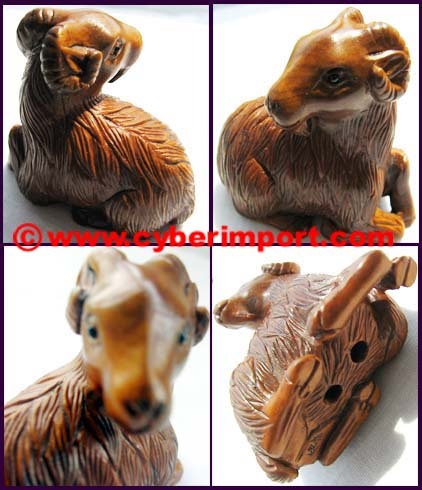 Wonderful set of detailed horns. He is standing with one leg up on a giant coin. Another rope of coins hangs from his mouth. Lots of good fortune. 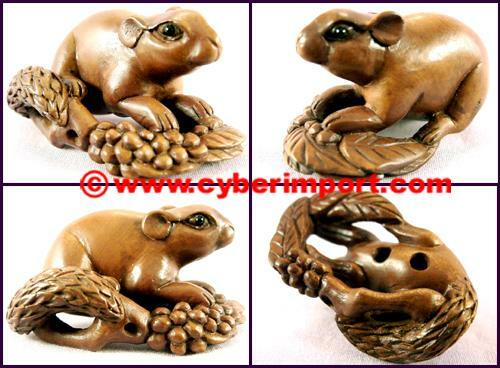 We no longer make any ironwood netsuke, but we can offer same design boxwood netsuke. 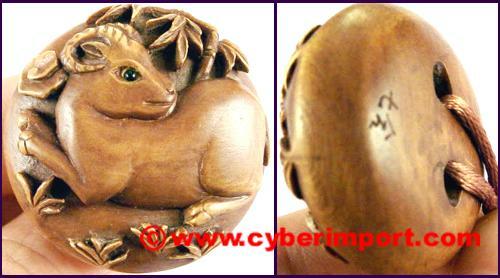 nsiw057 $8.39 15 - 2 1/8" x 1 1/4" x 7/8"
This well carved ironwood netsuke features a ram. It is standing guard over a money bag. Holding a rope that is connected to money with its teeth. Good detail in fur and horns. 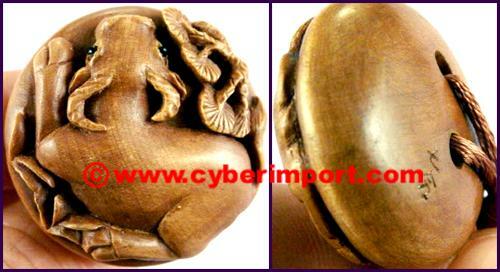 We no longer make any ironwood netsuke, but we can offer same design boxwood netsuke. 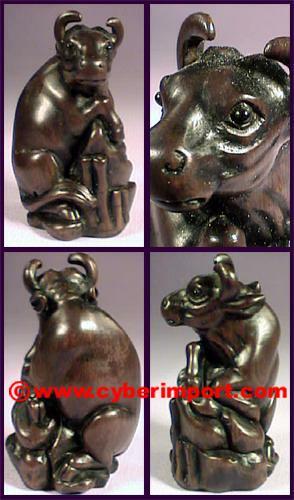 nsiw058 $8.39 15 - 2" x 1 1/4" x 1 1/4"
This well carved ironwood netsuke features a bull. It reminds me of the stock market, but up to your own interpretation. The bull is leaning on a "stone" pedestal that is surrounded with bamboo. 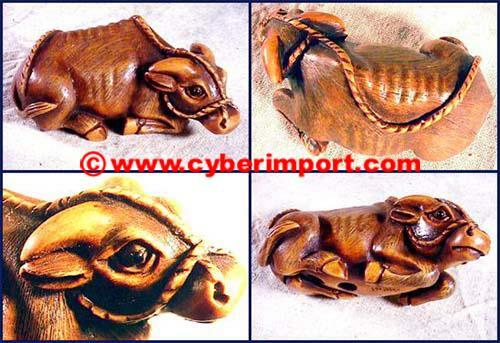 We no longer make any ironwood netsuke, but we can offer same design boxwood netsuke. 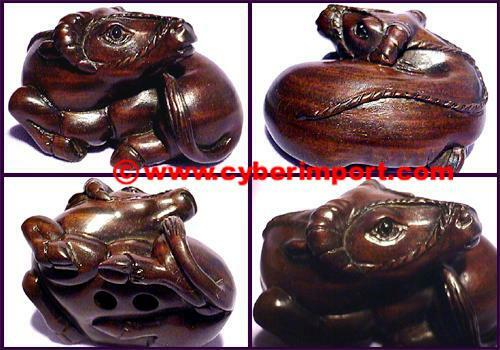 nsiw068 $8.39 15 - 2 1/8" x 1 3/8" x 1 1/8"
This well carved netsuke features a recumbent dog. His expression has an alert look. Hair is well etched. 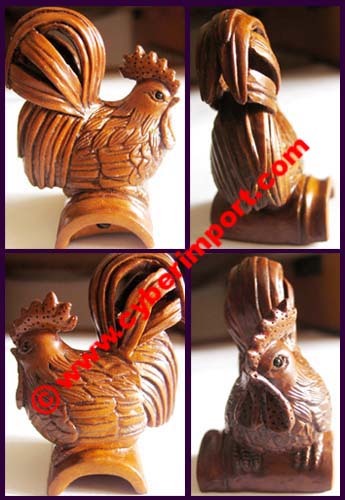 We no longer make any ironwood netsuke, but we can offer same design boxwood netsuke. 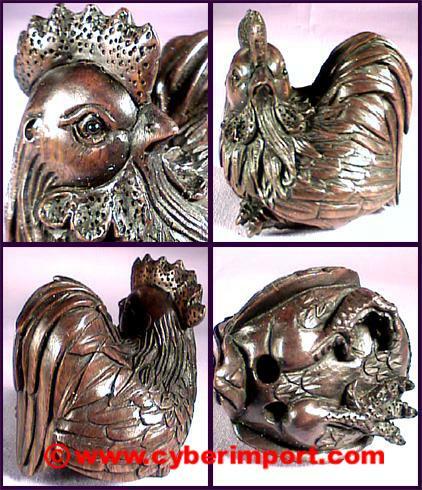 nsiw073 $8.39 15 - 1 1/4" x 2" x 1 1/8"
This well carved ironwood netsuke features a rooster. It is definitely lookin' for some hens. Beautiful feathers, and very cocky. 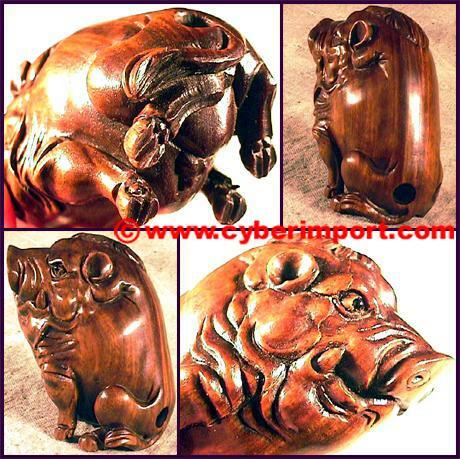 We no longer make any ironwood netsuke, but we can offer same design boxwood netsuke. 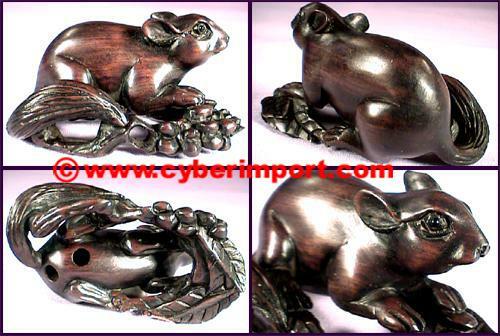 nsiw185 $8.39 15 - 1 5/8" x 1 1/2" x 1 3/8"
This squirrel has found a branch full of acorns. 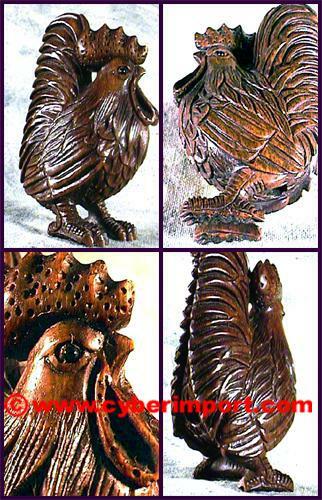 Fine carving detail. 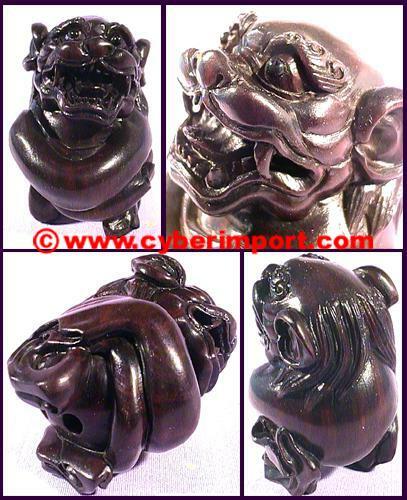 We no longer make any ironwood netsuke, but we can offer same design boxwood netsuke. 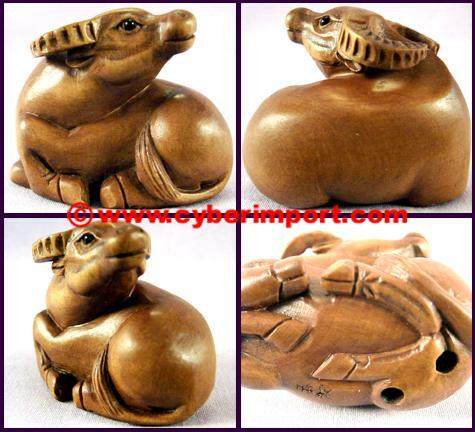 nsiw230 $8.39 15 - 1 1/8" x 1 7/8" x 1"
This well carved netsuke features a recumbent boar. Tusks on either side of its long snout. 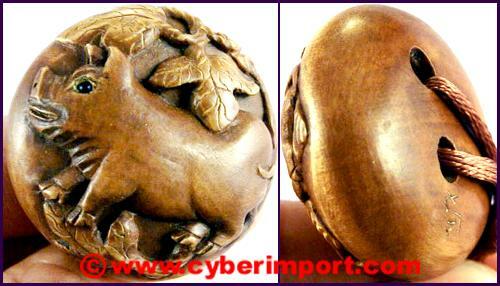 We no longer make any ironwood netsuke, but we can offer same design boxwood netsuke. 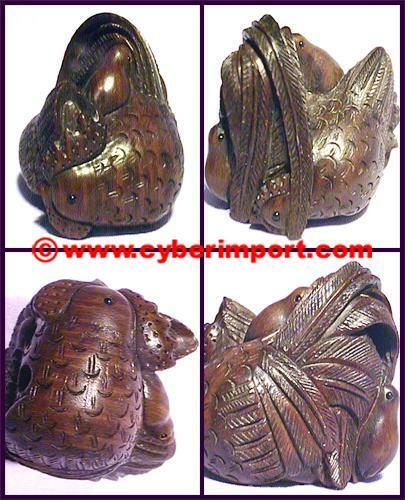 nsiw233 $8.39 15 16 1" x 2 1/2" x 1"
He nestled comfortably and looking behind him.Wonderful attention to feathers. 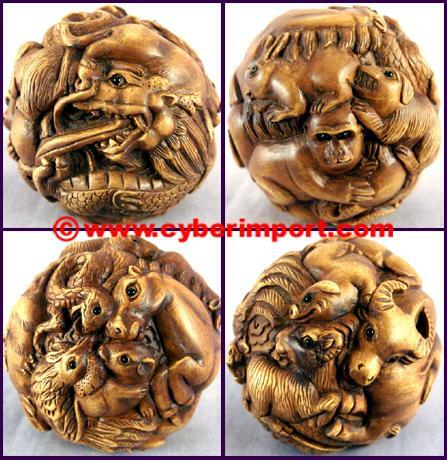 We no longer make any ironwood netsuke, but we can offer same design boxwood netsuke. nsiw324 $8.39 15 24 about 2"
He is standing and ready to strut his stuff. Wonderful attention to feathers. 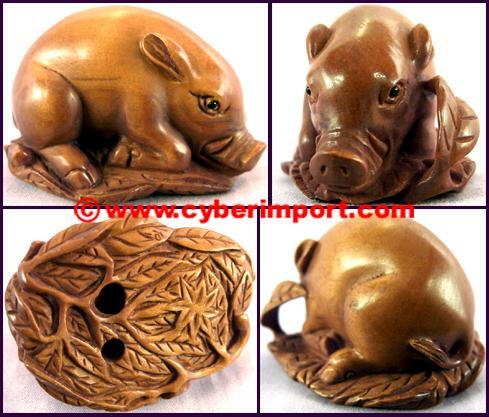 We no longer make any ironwood netsuke, but we can offer same design boxwood netsuke. 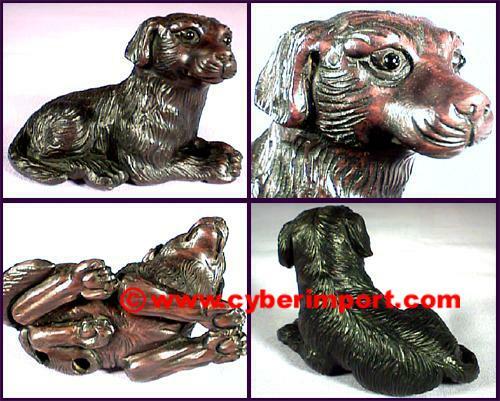 nsiw325 $8.39 15 14 about 2"
Standing positon. Long horns. 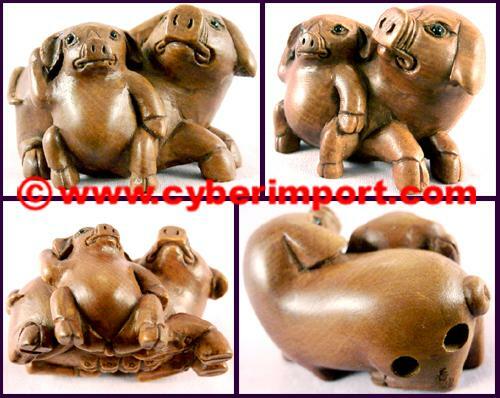 We no longer make any ironwood netsuke, but we can offer same design boxwood netsuke. nsiw332 $8.39 15 12 about 2"
Recumbent positon. 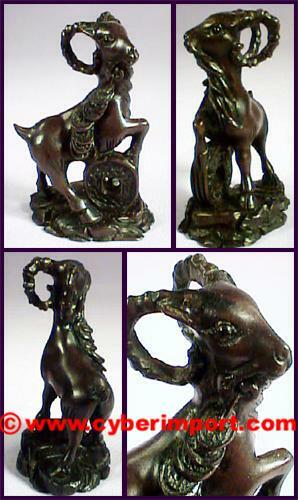 Short horns. 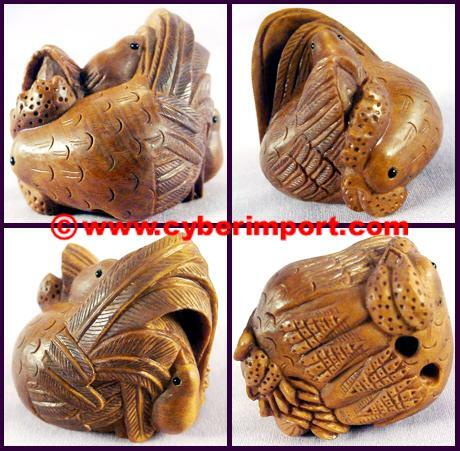 We no longer make any ironwood netsuke, but we can offer same design boxwood netsuke. 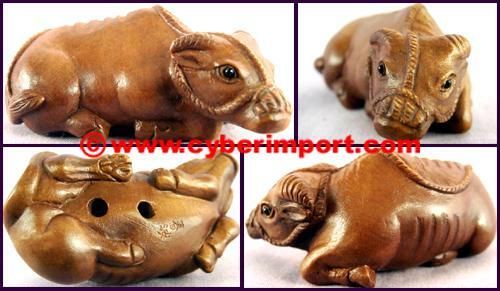 nsiw333 $8.39 15 14 about 2"
Short tusks. Even looks mean in a seated position. 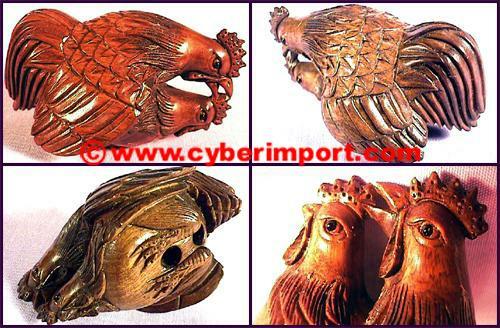 We no longer make any ironwood netsuke, but we can offer same design boxwood netsuke. nsiw334 $8.39 15 22 about 2"
Recumbent position. 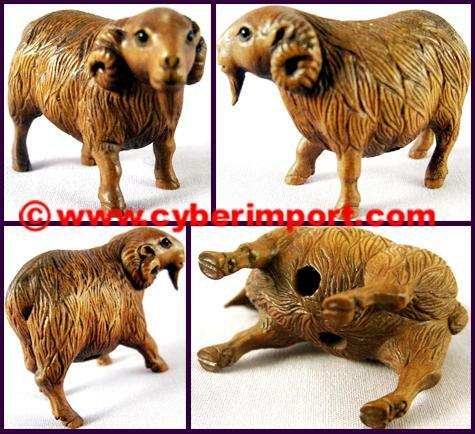 What is different about this one is the detail of the long rope along its back. 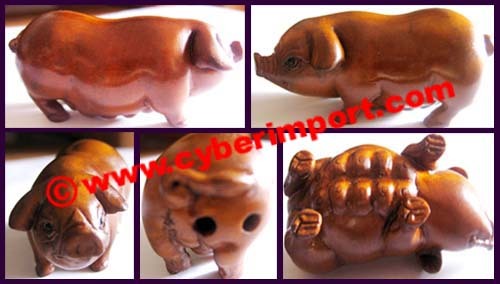 We no longer make any ironwood netsuke, but we can offer same design boxwood netsuke. 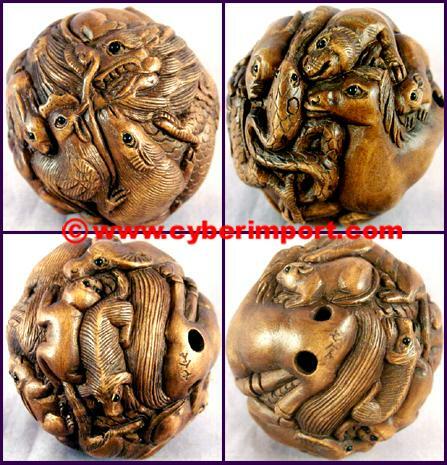 nsiw347L $8.39 15 22 about 2"
Intricate teeth, tongue. Wings wrapped as if hugging self. 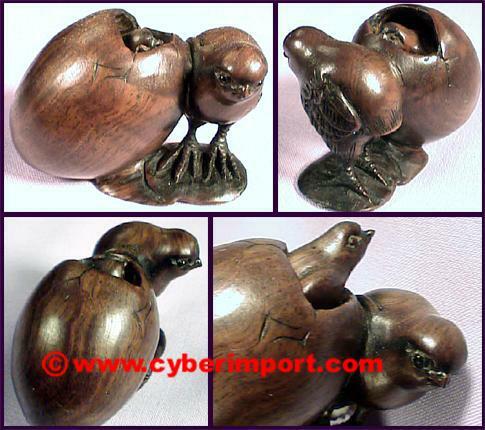 We no longer make any ironwood netsuke, but we can offer same design boxwood netsuke. nsiw364-2 $8.39 15 28 about 2"
Recumbent position. What an angry frown! 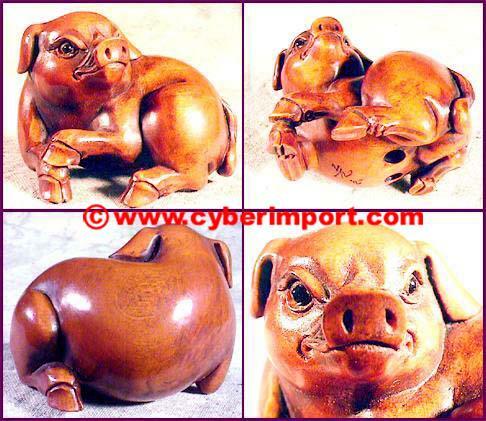 We no longer make any ironwood netsuke, but we can offer same design boxwood netsuke. nsiw367L $8.39 15 24 about 2"
Standing position and wearing clothes. He is shouting with happiness because of the fortune he is holding. 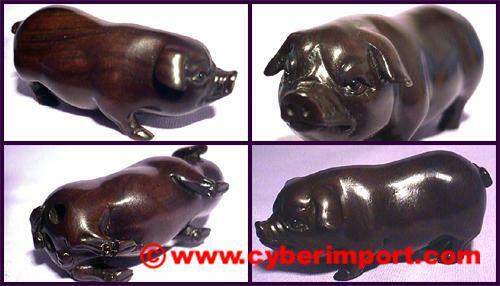 It is an ingot, the feudal Chinese form of wealth. 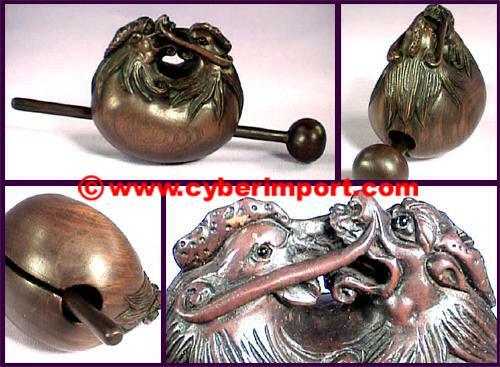 We no longer make any ironwood netsuke, but we can offer same design boxwood netsuke. 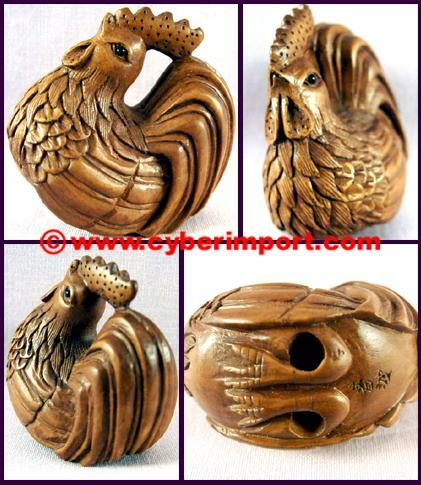 nsiw368L $8.39 15 24 about 2"
nsiw383-2 $8.39 15 34 2"
This well carved netsuke features a rooster and family. 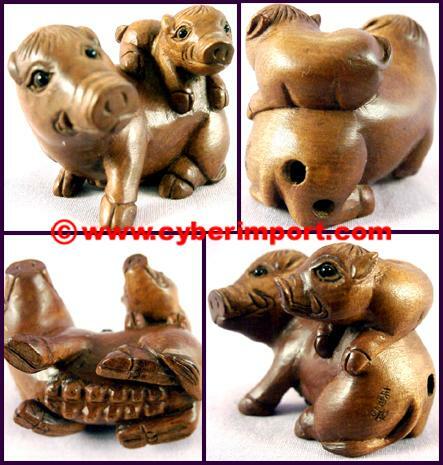 We no longer make any ironwood netsuke, but we can offer same design boxwood netsuke. 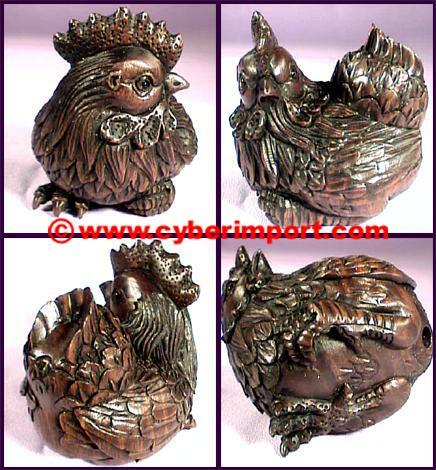 nsiw394 $8.39 15 26 2"
nsiw399 $8.39 15 22 2"
nsiw400 $8.39 15 24 2"
nsiw401 $8.39 15 22 2"
This well carved netsuke features a rooster. Eyes of glass inlay. Cord holes. Artist signature. Ironwood! 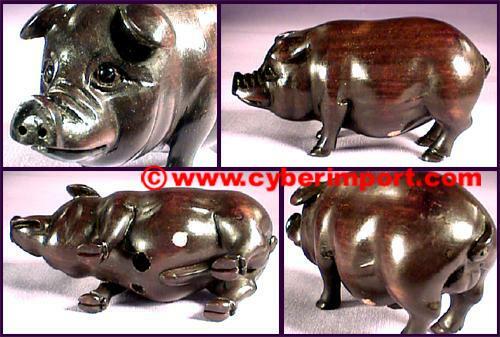 Difficult to carve and harder than teak or boxwood. 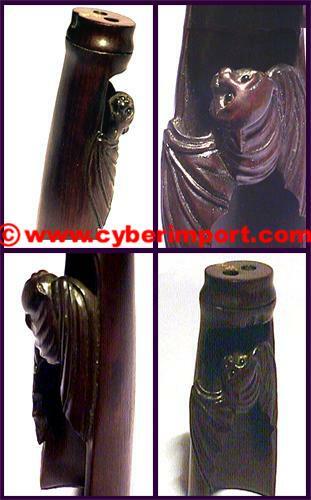 Perfect for the small, delicate detail of netsuke. So hard that it sinks in water. 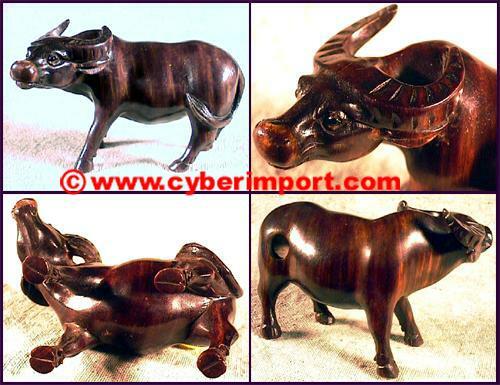 We no longer make any ironwood netsuke, but we can offer same design boxwood netsuke. 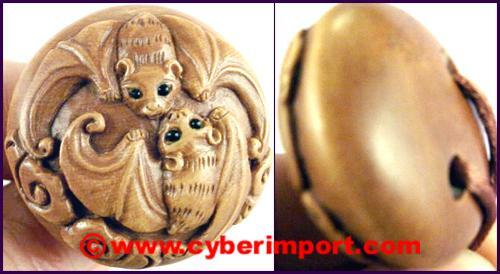 nsiw410 $8.39 15 22 2"
This well carved netsuke features a bat on bamboo. 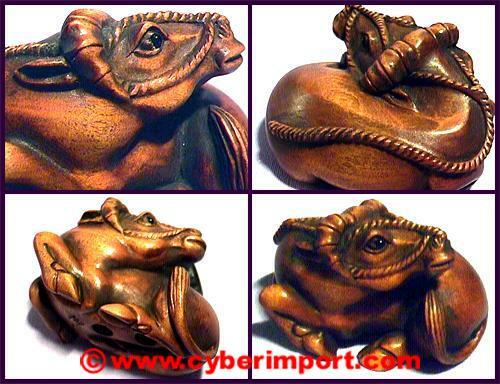 We no longer make any ironwood netsuke, but we can offer same design boxwood netsuke. 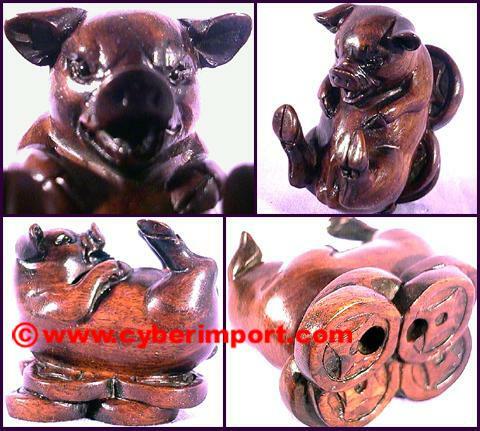 nsiw420 $8.39 15 16 2"
This is a well carved netsuke featuring a sow. Bottom side is equipped for feeding eight of her young at once. Nice finish on this piece. 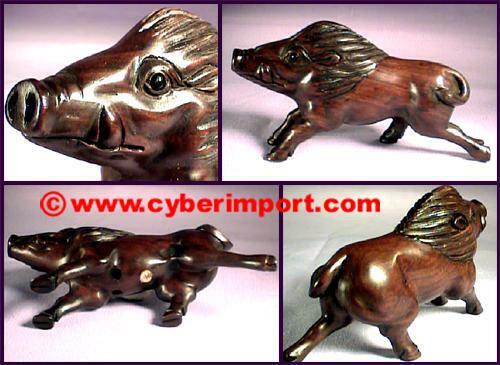 We no longer make any ironwood netsuke, but we can offer same design boxwood netsuke. 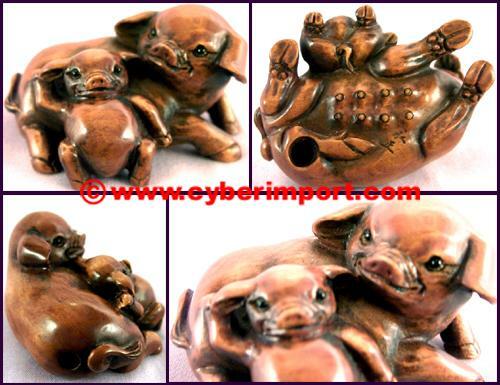 nstk001 $8.39 15 2 3/8" 1 1/8"
This is a well carved netsuke featuring a male pig. Really good lookin' porker with wrinkled snout! 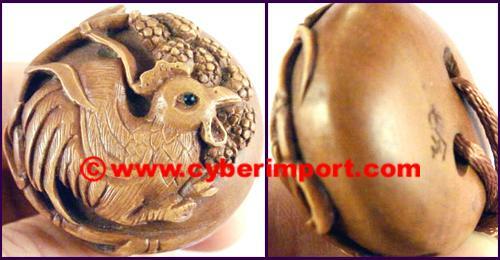 We no longer make any ironwood netsuke, but we can offer same design boxwood netsuke. 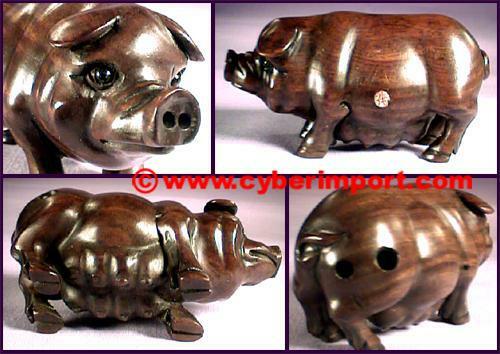 nstk002 $8.39 15 2 3/8" 1 1/8"
Wild boar charging through the bush. Dangerous teeth showing. 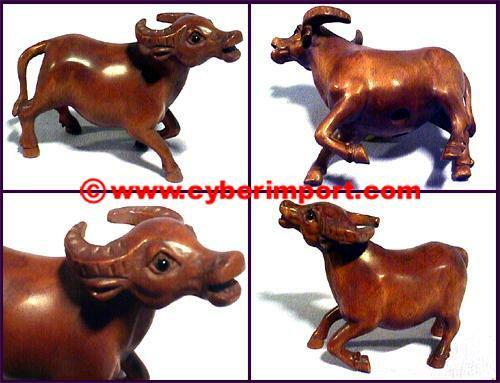 We no longer make any teakwood netsuke, but we can offer same design boxwood netsuke. 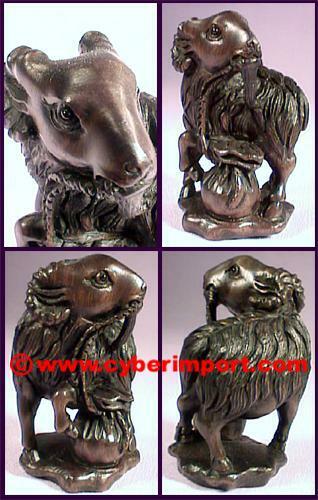 nstk003 $8.39 15 3" 1"
It is on a base and is carved in a run. Horns and hair well detailed. 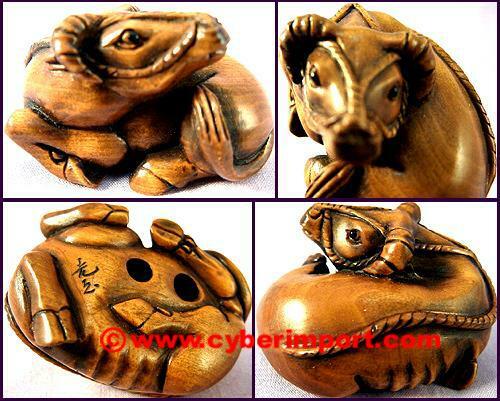 We no longer make any teakwood netsuke, but we can offer same design boxwood netsuke. 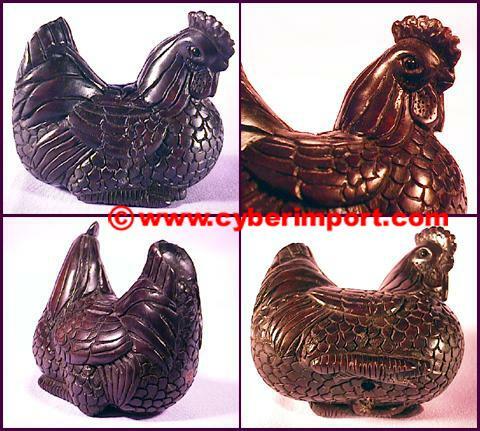 This is a well carved netsuke featuring a hen. She looks as if she could be sitting in a nest. 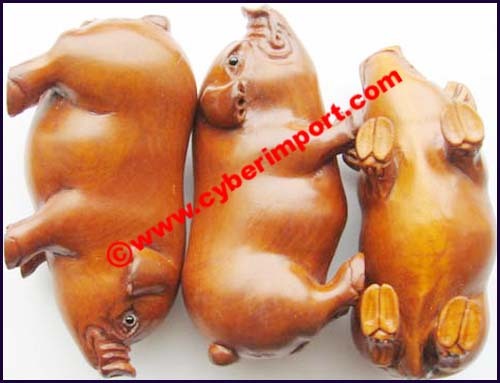 We no longer make any teakwood netsuke, but we can offer same design boxwood netsuke.